The Last Jedi takes our beloved main characters from The Force Awakens on separate journeys that are imperative to their character development: Ben Solo kills Supreme Leader Snoke and solidifies his roots as the bad guy, Rey takes on the symbolic journey of training as a Jedi with Luke Skywalker – or tries to, anyway – and Poe is prepping to become the leader of the new Rebel Alliance (you can read about Poe’s story here). No less important than these is Finn’s necessary journey in this film that solidifies his role within the Rebellion. He is transformed from a man who wants to run into a man who wants to fight. With the help of Rose, their mission to Canto Bight, and his battle with Captain Phasma, Finn gains an understanding of how important the Resistance’s message is and what it truly means to be “Rebel scum”. 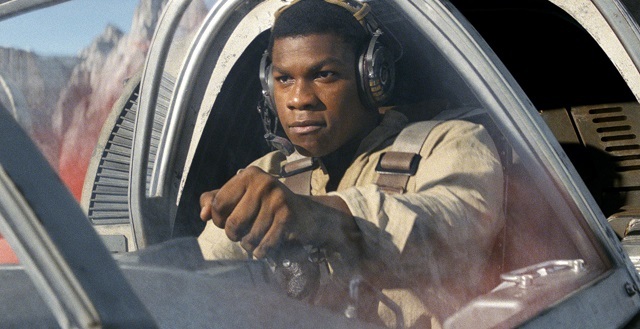 In The Force Awakens, Finn’s main “mission” is to leave the First Order behind and run to the farthest reaches of the galaxy. But how was this decision made and why? We are introduced to a stormtrooper who was taken from a family he will never know and thrust into an ideology he doesn’t identify with. In a rigorous training program, Finn, along with many other stormtroopers, is conditioned to serve the First Order and obey all commands without question. Only when he is faced with the prospect of killing innocents on Jakku does he make the decision to leave. But his doubts about the First Order can be traced further back than the events of The Force Awakens. Finn has a strong moment of truth in Before the Awakening that plants the seeds of his secession from the First Order. In the novel, Finn rescues one of his fallen comrades and he is chastised about it by Captain Phasma. According to the First Order, to have a strong group you have to leave the weak behind. Going back and saving fallen stormtroopers was a waste of resources – stormtroopers are expendable. To Captain Phasma, Finn is replaceable. He is only his number: FN-2187. He is tested once more when he has to go with a group of stormtroopers to kill Resistance fighters at a mining colony in Pressy’s Tumble. It is later revealed that the “Resistance fighters” are actually negotiators protesting harsh working conditions. Captain Phasma orders the stormtroopers to fire on them regardless but Finn doesn’t fire a single shot. Throughout this book and the beginning of The Force Awakens, Finn is shown the nature of the beast that is the First Order. While the majority of his comrades accept this as the way it is, Finn is able to detach from the hive mind and develop his own moral compass. With the evil of the First Order being cemented through Kylo Ren and the slaughter on Jakku, Finn makes a choice to run away. This decision to run motivates every judgment he makes during The Force Awakens. Finn has witnessed firsthand the evil of the First Order and believes fighting them is a hopeless cause. To Finn, there is no chance in taking on the bad guys. He recognizes the lengths they are willing to go to in order to eradicate those who fight back. They kill without mercy and are an unstoppable force. Finn’s only solution to this tyranny is to run as far away from it as possible. We are introduced to a person who is broken and lost. In order for him to tag along with the Resistance fleet, he literally has to be dragged while he’s unconscious. When Finn comes to in The Last Jedi, he still has the same mindset of leaving – and why wouldn’t he? Even though the film takes place right after the events of The Force Awakens, there have been major shifts in the people closest to him: Poe is leading an attack as a Commander against a First Order Dreadnought and Rey is off to retrieve the legendary Luke Skywalker. All while Finn is running off to the nearest escape pod. 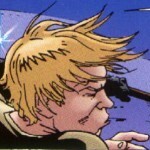 After Rose shocks him, he is once again dragged against his will back into the fight. Even though Finn is constantly trying to escape, he is repeatedly pulled against his will into the fight against the First Order. Finn is reluctant to help the Resistance until he realizes he can keep Rey safe by doing so. If he can get to Canto Bight, find the Master Codebreaker, and help Rose shut down the hyperspace tracker, then he can guarantee Rey’s safety when she journeys back to the group. It isn’t until he goes with Rose to Canto Bight that he begins to shift from running to fighting. While the Canto Bight subplot has been seen as “useless” to some, it is absolutely vital to Finn’s shift in character. Up until this point, he’s been doing everything in his power to leave the Resistance. Of course, he has a conscience, and he wants to make sure Rey is safe before he ventures off. In this mission, Finn sees two potential outcomes for himself: Rose is who he will become if he joins the Resistance and DJ is who he could become if he runs away. He can sell his knowledge to the highest bidder and live a rich life amongst the wealthy elite or he can tear down the system and fight injustice. Finn loves the scene around him at the casino but Rose is quick to take off his rose-tinted glasses (pun intended?). She shows him who really suffers in wars, and who gets neglected and left behind. With this revelation, Finn begins to understand what the Resistance is truly about. The final push that solidifies his path is DJ’s betrayal. At that moment, Finn has finally become a Rebel. The climax of Finn’s development is his fight with Captain Phasma. This fight represents a mental and physical shift when Finn strikes Phasma down and refers to himself as “Rebel Scum”. Rather than just tagging along with the Resistance and being dragged to the battle against the First Order, Finn has decided for himself what path he wants to go down. In fact, he is so dedicated that he is willing to sacrifice himself for the Rebellion on Crait – and again, when he offers to help Luke Skywalker fight off the First Order. These two attempts at throwing his life away for the Rebellion are a complete 180 from the Finn we met two films ago. He’s gone from one extreme of just trying to survive to another extreme of voluntarily flying into a cannon. Although this moment is meant for Rose to be the hero, it requires Finn’s growth as a character in order to make it meaningful. The hatred he had for the First Order went from fueling his escape attempts to fueling his attempted suicide. His journey in The Last Jedi has been substantial but, with the realization that Rose gave him, it is clear that he has more to learn. Finn needs to abandon his hatred and embrace love in order to truly save the Rebellion. It is interesting to note how Finn was constantly met with resistance when he was trying to run away. There always seemed to be some type of FORCE that pulled him back to the Rebellion. Finn’s character arc could potentially set him up for a large role in Episode IX. Who knows, maybe there was some merit to that scene of him moving the ancient Jedi texts to grab medical supplies. Perhaps Finn’s destiny will have a larger role than we originally thought. Have we already forgotten the context in which Finn decided to leave the First Order or what his backstory is? The man was a slave to the First Order and quit when he got his first taste of the Order’s cruelty and disdain for people, especially little people. You said it yourself, he quit after his “first taste”—he had no idea what the average citizen’s life was like, he’d only known the life of a soldier. He realized the FO was bad but the details were abstract enough that he was able to disregard them in favor of his own safety.